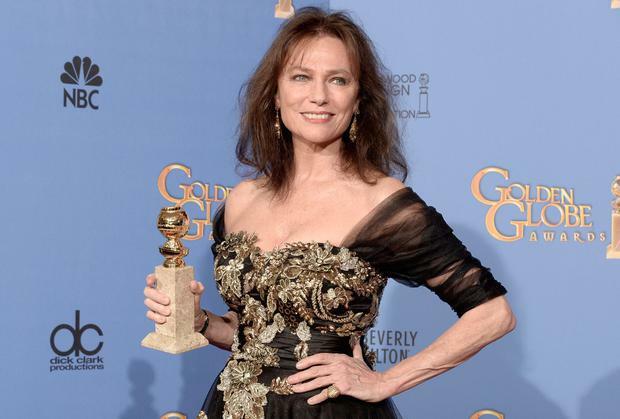 When Jacqueline Bissett won her best supporting actress award at the Golden Globes last weekend, she made a rambling, semi-coherent speech that had the producers of the show trying to drown her out with a steadily rising orchestra crescendo. This prompted the classically trained actress to authoritatively raise her voice above the din. "Forgive everyone," she exhorted the galaxy of stars in the crowd. "Forgiveness is the best beauty treatment." Bill Clinton, who, to the amusement of many, had "crashed" the awards show, was possibly amongst those who sneered at Bissett's woozy stab at profundity. Two days later, Bubba was refusing to deny the claims that he and Hillary have a frequently updated compendium of those who had helped and wronged them throughout their storied careers. According to a new book, the list of so-called 'sinners and saints' -- including John Kerry, now US secretary of state, and the late Ted Kennedy, both reportedly once regarded as disloyal -- was put together on a spreadsheet in the final days of Hillary's losing bid for the Democratic presidential nomination in 2008. And since then the list has grown and grown. In some ways, this should not massively surprise anyone. The Clintons must have amassed such an array of enemies that they can hardly be expected to commit all of their grudges to memory. But something about the word 'spreadsheet' probably sends a shiver down the spines of most people. Serve revenge cold by all means but don't involve Excel in the process. It suggests an eerie combination of bloodless administration with implacable bloodlust. And yet we can hardly object to the principle of the project. Everyone, from Alex Ferguson to Homer Simpson, had a shitlist, and in the dark of the night, when you are mentally picking through the detritus of the day, you probably wouldn't be long naming the people who would make it onto yours. The older I get, the shorter my list grows, but it was once longer than Schindler's. The powerlessness of youth gave me vast reserves of rage, which at the time I felt confident of nursing into adulthood. As I lacked Carrie's telekinetic ability to make everyone die in a fire, there was no other revenge to take than remembering and waiting. I tattooed the names of childhood bullies onto my soul. I imagined making crucial care home decisions for elders who got on the wrong side of me. I daydreamed of becoming famous and triumphantly reminding my newly converted sycophants of their former lack of deference. Like Kevin Spacey in House of Cards I would bide my time until they were all sorry. As I got older, however, the shitlist steadily dwindled. For one thing, I didn't have the organisational skills to maintain an actual list -- too much admin for my liking -- or the patience to wait for the moment when the right opportunity for revenge presented itself. But I also realised that even people who have absolutely wronged you can be forgiven, or at least not cared about, if you understand that in almost all cases of you being f**ked over it was nothing personal: you just happened to be standing in their way. This might have meant they were lazily ruthless, casually cruel, but they were probably that way to everyone: it shouldn't entitle them to a place inside your head for all eternity. I like to think that a part of this pragmatism is to do with the nature of journalism, which means you frequently, sometimes without meaning to, offend some person or other. All it takes is a poor review (a few hours of writing for you, years of work for them), a skewering interview (you think you knew them well enough to write that after one hour in their company? ), a piece of news someone would rather not have reported and lo, you have booked your own place on someone else's shitlist. If everyone kept as meticulous track of their grudges as the Clintons are supposed to, we wouldn't get very far. I would have been happy to serve revenge cold -- I'm sure it's still delicious -- but the thought of anonymously settling some score never appealed to me. A friend of mine likes to boast that anytime he has taken revenge upon -- and he is a master of it -- "they never even feel the knife go in". I've heard variations of this from other people too, but to me it wouldn't be worth it unless the shitlist nominee knew from whose hand the Sword of Damocles fell. If they aren't aware who is sticking the pins in the voodoo doll and why, then there would be no satisfaction for me. And if they are aware, then you just end up on their shitlist, which is dangerous at best. It's probably simpler all round to just move on. George Herbert wrote that "living well is the best vengeance" and an important part of living well is not becoming too wedded to your shitlist. Keep it short and snappy. Because by the time it's formalised enough to merit its own spreadsheet, you don't own it: it owns you. Bitterness eats its way into your soul like an acid and out again like a cancer. Jacqueline Bissett was called "bonkers" last week but she's only now hitting her career stride and at 69 looks younger than either Clinton. Perhaps, despite the mockery, she might be on to something.